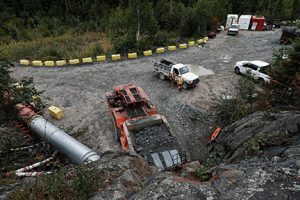 It’s still lean times for junior miners looking for funding to build the next mine, but since it released its first preliminary economic assessment (PEA) for its Madsen project three years ago, Pure Gold Mining has been putting together a compelling portrait of a low-cost, scalable, and near-term mine. The latest pieces of the picture come from complementary economic studies released early this year. A February feasibility study outlined a capex of $95-million for the past-producing underground project, in Red Lake, Ont., with a 12-year mine life and average production of 80,000 oz. per year. The low capex does seem to be tailored to today’s tough mining capital market. But the most compelling aspect of the project is the potential that the feasibility is just the beginning of something bigger. Shortly after it released the study, Pure Gold also released an initial PEA for several satellite deposits near Madsen that, together, could add 3.7 years of mine life and total production of 210,000 oz. gold. Labrenz says the studies show the phased development plan that Pure Gold has put together: the feasibility outlines a “starter mine” at Madsen with a robust mine plan and lowest in class capital, and the PEA lays out a blueprint for expansion. “The PEA is really meant to show the potential for not only a mine life extension, but an opportunity for us to start looking at ways to impact the production profile moving forward,” he says. Being located in the prolific and high-grade Red Lake gold camp, it’s perhaps not surprising that Madsen was a profitable, operating mine for 36 consecutive years. Between 1938 and 1976, it produced 2.5 million oz. of gold at an average grade of 9.9 g/t gold. It was mined down to 1,200 metres, but without much systematic exploration, the miners ended up chasing the orebody far from the shaft, with mining of the Austen zone ending up about 2.5 km away from the headframe. Junior Claude Resources put the mine back into production briefly in the late 1990s. A combination of low gold prices, high mining costs (its contract miners were paid by the tonne), and a lack of exploration led them to put it on care and maintenance in 1999. Pure Gold’s approach, since acquiring the property in 2014, has been more methodical, prioritizing exploration and a solid geological understanding of Madsen above a quick push to production. The first thing the team did was to digitize all existing data for Madsen, including underground mapping, mined stope shape and drill hole data. “All those records were in paper format so there wasn’t a really strong understanding of the deposit itself,” Labrenz says. That data, combined with over 200,000 metres of drilling that Pure Gold has conducted over the past three years, have yielded insights about the geology and Madsen’s potential. Previously, Madsen was seen as a stratabound, disseminated replacement style deposit, different from the other Red Lake deposits, which are structurally controlled. “Our work demonstrated that it is a structurally controlled deposit, exactly the same as every other deposit, and once you recognize that structural control it allowed us to step out and test it,” Labrenz says. That understanding allowed Pure Gold to grow resources at Madsen and led to the discovery of the Wedge deposit, 3 km south of Madsen, in early 2018. In a very short period of time, the company has been able to compile a resource at Wedge and bring it into the recent PEA. Results from a test mining program at Madsen last year have backed up Pure Gold’s geological model. More than 7,000 tonnes of material were collected and stockpiled and 1,555 muck samples were assayed. Two stopes were developed, based on stope shapes from a previous PEA. The company plans to use a mixture of conventional cut and fill (59%), mechanized cut and fill (16%), and longhole mining (25%) methods. The economics of the project are strong. At a base case of US$1,275 per oz., the study projected an after-tax NPV of $247 million (using a 5% discount rate) and an internal rate of return (IRR) of 36%. Total cash costs are expected to be US$607 per oz. gold with an AISC of US$787 per oz. Probable reserves contained in the Austin, 8 zone, South Austin, McVeigh and A3 zones at Madsen total 3.5 million tonnes grading 9 g/t for 1 million oz. gold. (Indicated resources at Madsen are 7.2 million tonnes grading 8.9 g/t gold for 2.1 million oz. ; inferred resources are1.9 million tonnes grading 7.7 g/t gold for 467,000 oz.) The feasibility study projects Madsen could be up and running in a short 13 months, once a production decision is made. With the wealth of existing infrastructure, the major costs would be an expansion of the mill to 800 t/d from 550 (including a new ball mill and the installation of a gravity circuit to take advantage of the simple metallurgy of the ore), and a new water treatment plant. The water treatment plant is needed based on changes in regulations since Madsen was last permitted in the 1990s and on new water quality information collected as part of the feasibility study. While the capex is significantly higher than the $51 million that was projected in a PEA released in September 2017, the higher capex has to do with an increase in tonnage to 800 t/d from 600 t/d (the current plant can handle more than the 550 t/d it was designed for), as well as a move to owner operated mining from contract mining (which will make more equipment purchases necessary). A third change is that the company will now put in a new hoist in order to use the 1,275-metre existing shaft to move ore and waste rather than the ramp starting in the third year of operations. Madsen is still permitted as a mine, though some permits need to be amended. As for the satellite deposits, Wedge, Russet South and Fork, the recent PEA looked at developing them as a mine life extension to Madsen. The study projected that mining the deposits would cost $57 million and yield an after-tax IRR of 39% using existing infrastructure. The deposits host combined indicated resources of 7.2 million indicated tonnes grading 8.9 g/t gold for 2 million oz. and 1.9 million inferred tonnes grading 7.7 g/t for 467,000 oz. Now that the feasibility and PEA studies are completed, Pure Gold is focused on two things: getting the cash to build Madsen, and continuing to grow the project through further exploration. Labrenz points out there are few gold projects out there with the type of grade that Madsen boasts, something that should be a sell on the financing side. The company’s largest shareholders include Anglogold Ashanti, which last year increased its holding to 14.9% of Pure Gold’s outstanding shares. On the exploration side, vice-president of exploration Phil Smerchanski has put together an exploration program and budget for 2019, which at press time, was before the board for approval. The Madsen deposit can be traced for over 5 km of strike length, leaving lots of scope for new discoveries in addition to growing existing resources. “That’s one of the keys for our project moving forward is the tremendous exploration upside that we see,” Labrenz says. The company is also targeting Madsen’s high-grade 8-Zone, which boasts grades in the range of 20 g/t gold. “We’ve relogged all the core in that area, we have a model for how that may be repeated up towards surface, so we have a plan for testing that,” Labrenz says. While it’s been “full speed ahead” for the past three years, the bigger picture at Madsen is just emerging.